Santa Claus, Saint Nicholas, Saint Nick, Father Christmas, Kris Kringle, Santy, or simply Santa is a mythical figure with historical origins who, in many Western cultures, brings gifts to the homes of well-behaved, “good” children on Christmas Eve (24 December) and the early morning hours of Christmas Day (25 December). The modern Santa Claus is derived from the British figure of Father Christmas, the Dutch figure of Sinterklaas, and Saint Nicholas, the historical Greek bishop and gift-giver of Myra. During the Christianization of Germanic Europe, this figure may also have absorbed elements of the god Odin, who was associated with the Germanic pagan midwinter event of Yule and led the Wild Hunt, a ghostly procession through the sky. Santa Claus is generally depicted as a portly, joyous, white-bearded man—sometimes with spectacles—wearing a red coat with white collar and cuffs, white-cuffed red trousers, and black leather belt and boots and who carries a bag full of gifts for children. Images of him rarely have a beard with no mustache. This image became popular in the United States and Canada in the 19th century due to the significant influence of the 1823 poem “A Visit From St. Nicholas” and of caricaturist and political cartoonist Thomas Nast. This image has been maintained and reinforced through song, radio, television, children’s books and films. 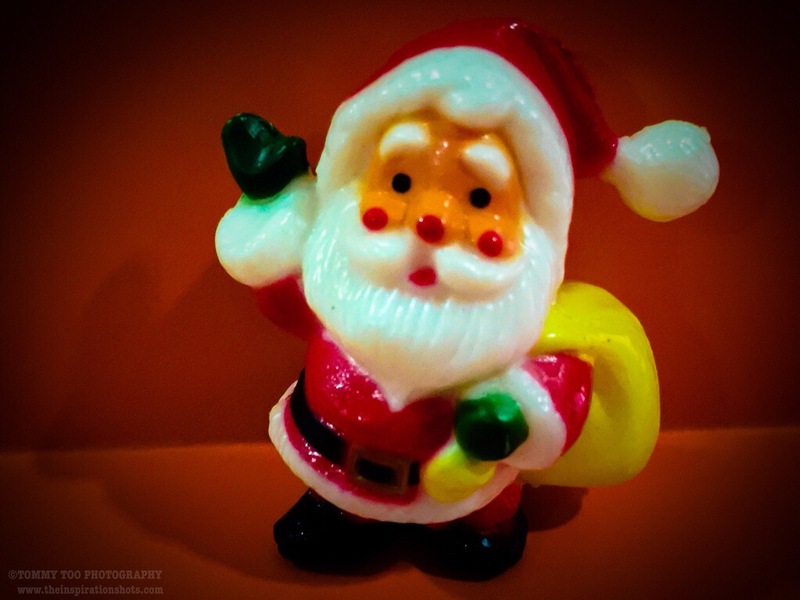 Santa Claus is believed to make lists of children throughout the world, categorizing them according to their behavior (“naughty” or “nice”) and to deliver presents, including toys, and candy to all of the well-behaved children in the world, and sometimes coal to the naughty children, on the single night of Christmas Eve. He accomplishes this feat with the aid of the elves who make the toys in the workshop and the flying reindeer who pull his sleigh. He is commonly portrayed as living at the North Pole and saying “ho ho ho” often. Posted on August 18, 2016, in iPhoneOgraphy 366, Photography and tagged #iphone6plus, #iphoneography366, #photography, Festival, photooftheday, santaclaus. Bookmark the permalink. Leave a comment.